Our Yoga stools, or meditation stools are designed with purity and simplicity in mind, to complement the users inward search for peace and mindfulness. The yoga stools are designed with an angled seat that enables a person to sit and kneel in a comfortable, ergonomic position that keeps the spine and back in a natural position. This enables the user to meditate in a comfortable position and with the body relaxed so that the mind is free to focus without distractions. 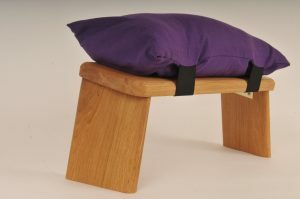 Body weight is supported by the meditation stool rather than the knees and this allows for long periods of uninterrupted meditation without discomfort and more importantly distraction. Hands are simply placed in the lap. 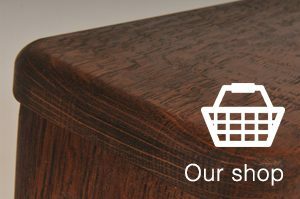 The Yoga stools are handcrafted through traditional carpentry methods using oak from sustainable sources often from my own local woodland. The stools are very helpful for yoga and they are very comfortable without a cushion although some people do prefer some additional padding. 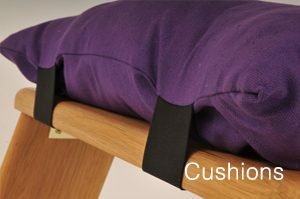 Cushions are also available and are specifically designed for use with the yoga stools we make. The yoga stools are finished in Linseed oil which allows the beauty of the grain to shine through. Meditation stools and yoga stools are also available with different finishes. The legs of the yoga stools are rounded at the base so that it is possible to rock into a comfortable position. The legs are also angled outwards so that they are not able to fold in on themselves. 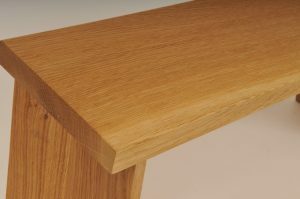 The edges of the stools are all gently rounded so there are no sharp corners. The folding legs of the stools also allow for easy transport and storage. Seat is 46 cm or 18 inches in length. The width of the seat is 15cm or 6 inches. length of the seat is 48cm. 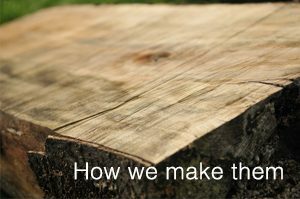 or 7 inches sloping to 16cm or 6 ¼ inches . or 8 3/4 inches sloping to 19cm or 7 1/2 inches . or 6 ¼ inches sloping to 14cm or 5 1/2 inches.